The Apple by Picnic Time is the ideal accessory for your next cocktail or dinner party. It's..
Blue Bottle Serving Platter (P/N BP B). A colorful and eco-chic serving accessory perfect for .. The Caddy Deluxe Cutting Board and Tool Set is like no other cutting board. Shaped like a golf bag..
Cork Cheese Knives - Set of 2 (P/N KNFS018). Add your own special cork onto the end of the plated br..
As appropriate for an afternoon wine and cheese picnic as for fine dining, our polished, wood-handle.. 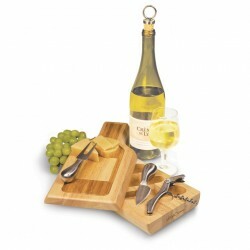 The Grapes cutting board and tool set is a split-level, laser-engraved two-toned bamboo cheese boa.. The Heart cutting board and tool set is so elegant in its simplicity and design, it bodes well no ..
Laguiole Stainless Steel Cheese Knives Set of 3 (P/N JD98616). Experienced craftsmen use the finest ..
Get the party started with the Mariner! Designed to look like a ship's helm, the Mariner is a ..
striking serving piece. Imported from Turkey. Available in 2 sizes, small and large. The la..
Milano Tray Small (P/N TPS450). The faux crocodile leather on the top and bottom of the tray i.. DESCRIPTION Shaped like the lower 48, this cheese board is pure America. It is made from durable .. This gourmet cheese tool set features a stout serving fork that holds cheese in place, while you use.. DESCRIPTION Each of three specialized cheese knives is designed for expert service of soft, mediu.. The Reserve is a glass-topped cheese board that can also be used as a serving tray. The glass top .. The Rustic Farmhouse Gourmet Cheese Set is a beautiful collection of four assorted cheese tools. Wit.. The gorgeous pairing of slate and acacia wood makes this lazy susan unlike any other. Equally perfec.. DESCRIPTION The Rustic Farmhouse Gourmet Cheese Set is a beautiful collection of four assorted ch..